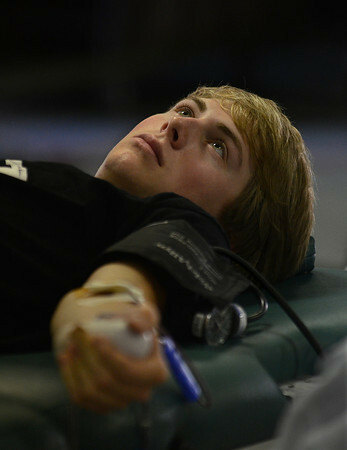 Wes Fabyan of Manchester gives blood Thursday during the Red Cross blood drive in the parish hall of Sacred Heart Catholic Church in Manchester. Blood drive coordinator Keval McNamara said traffic was down considerably since the previous drive in the spring, but the higher turnout then may have been influenced by the Boston Marathon bombing. "I still think it will be a good drive," Kevel said midway through the day's event. "People need to understand that even if there's not a catastrophe in our back yard, there are other areas that are in greater need of blood."